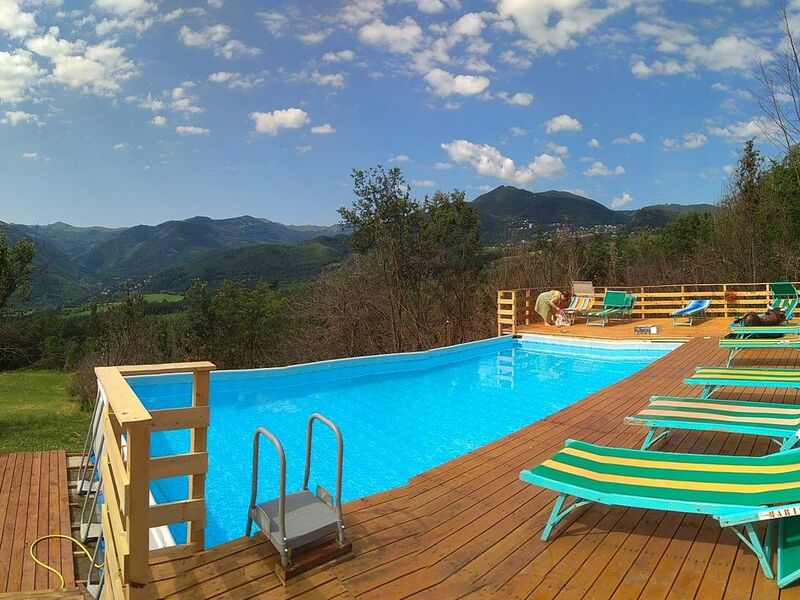 A House in a fully renovated stone-built farmhouse of 3 houses, with excellent facilities, standing 800 metres above sea level on the border with Tuscany and on the verge of the Frignano Natural Park, 2 hours from Florence and Lucca, 1 Hour from Bologna and 3 hours from venise.. The farm has gardens with a pool and solarium, and 8 hectares of meadows and woodland where guests can wander freely. The apartment offers an enchanting view over mountains reaching to a height of over 2000 metres. Within Italy, the towns of Fanano and Sestola are considered two of the Apennine mountains' finest resorts; Fanano is well known for its outdoor stone sculpture museum, its historic hamlets and its fine wooded scenery; Sestola, famous as the "Pearl of the Apennines", is popular with both winter sports enthusiasts and summer visitors. The surrounding mountains offer a wealth of paths for walkers of all levels and mountain-bikers. Also available locally are an ice-rink, tennis-courts, municipal swimming-pools, restaurants and night-spots for young people. Fint gammelt hus, med plads til os alle 17 (børn og voksne). Huset hænger sammen med nogle lejligheder i den ene ende og “vores” hus i den anden. Lige overfor ligger der et andet hus. Udover os 17, var der en anden familie på 7 (børn og voksne) og der kom yderligere en familie på 13 (børn og voksne). Det føltes dog ikke trængt. Poolen og området omkring er virkelig lækkert, med den smukkeste udsigt. Der er mange små hyggelige og skyggefulde kroge. Køkkenet har alt hvad vi havde brug for og der var fint plads til os alle. Restauranten i Trentino (1km) var god, og der er legeplads og fodboldbane. De fleste butikker holder siesta mellem kl 12-16. Der er slagter i Sestola ellers handlede vi i supermarked/købmand på vejen til Fanano (10 min i bil). Vi kørte en tur til Bologna, det kan virkelig anbefales. Sestola er hyggelig, men turistet. En tur på Monte Cimone er også anbefalelsesværdig. Alt i alt et skønt sted til en god pris. "This is an absolutely adorable place. The appartments are well equipped, pleasant and clean. The panoramic view is always changing and beautiful. There is pleanty parking space. We came with 5 children and they loved the place. Bianca and Loris are the nicest hosts, always going out of their way to help." Casa situata in zona isolata ma vicina ai centri cittadini di fanano e sestola. By car: Modena sud motorway exit, follow signs for Fanano, 5 km before Fanano turn for Trentino-Sestola. You will find signs for the farm along the road.